Galatasaray Spor Kulübü, is a Turkish football club based on the European side of the city of Istanbul. It is the association football branch of the larger Galatasaray Sports Club, itself a part of the Galatasaray Community Cooperation Committee which includes the prestigious Lycée de Galatasaray, where the football club was founded in October 1905 consisting entirely of student members. Galatasaray is the most successful Turkish football club; domestically, they have won 21 Süper Lig titles, 17 Turkish Cups and 15 Turkish Super Cups. Galatasaray is one of three teams to have participated in all seasons of the Süper Lig since 1959, following the dissolution of the Istanbul Football League. Internationally, Galatasaray has won the UEFA Cup and UEFA Super Cup in 2000, becoming the first and only Turkish team to win a major UEFA competition. In the 1999–2000 season, the club achieved the rare feat of completing a quadruple by winning the Süper Lig, the Turkish Cup, the UEFA Cup and the UEFA Super Cup in a single season. Galatasaray is also the only Turkish club to have been ranked first on the IFFHS World Rankings. Since 2011, the club's stadium is the 52,332-capacity Türk Telekom Stadium in Seyrantepe, Istanbul. Previously, the club had played at the Ali Sami Yen Stadium, as well as a succession of other grounds in Istanbul, which included groundshares with Beşiktaş and Fenerbahçe at the Taksim Stadium and İnönü Stadium. As a result of the team's 20th championship for the 2014–15 Süper Lig season, their logo hereafter contains four stars representing their 20 championships for the league; each star corresponds to five of the team's championships. 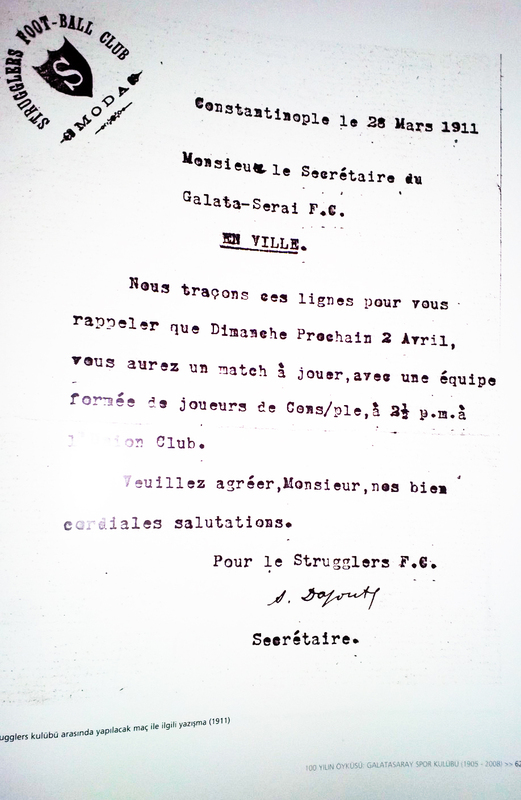 According to researcher Cem Atabeyoğlu, Galatasaray took its name from one of its first matches. In that match, Galatasaray won 2–0 over a local Greek club and the spectators called them "Galata Sarayı efendileri" (English: "Gentlemen of Galata Palace"), and, after this incident, they adopted that name and started to call their club "Galata Sarayı". In 1905, during the era of the Ottoman Empire, there were no laws for associations so the club could not be registered officially, but, after the 1912 Law of Association, the club registered legally. Türkiye Profesyonel 1. Ligi (Turkish Super League today) formed in 1959. This is the top-flight professional league in Turkish nationwide football, and the most popular sporting competition in the country. Galatasaray joined all seasons and won 21 league titles since then. The Turkish Football Federation began organizing the Turkish Cup (today it is organized with the name Ziraat Turkish Cup) in the 1962–63 season for Turkish clubs to qualify for the UEFA competitions. This is the only national cup competition in Turkey. Galatasaray joined all seasons and won 16 trophies since then. Probably the greatest record that the club holds is winning national championships in 15 different sport branches in the 1986–87 season. Galatasaray's most successful era came in late 1990s, when the club become the first and only Turkish football club to win a major UEFA competition. They were aided in this by one of Turkey's best generation of homegrown footballers who went on to finish third in the 2002 FIFA World Cup, after having played in the quarter-finals of UEFA Euro 2000. Besides the talented players, visiting teams also disliked traveling into Ali Sami Yen Stadium, literally dubbed "Hell" by Galatasaray supporters due to the intimidating atmosphere provided by the fans including chants and riots in the crowds. There are many successful footballers who have played for Galatasaray and made their mark on Turkish football history. The team's legendary players include Nihat Bekdik nicknamed Aslan (Lion); the 1930s national hero Eşfak Aykaç; Boduri who died aged 21; Mehmet Leblebi who scored a domestic record of 14 goals in a single match; Gündüz Kılıç nicknamed Baba (Father) who was the coach but also the player of his team in the 1950s, with great success in both duties; Bülent-Reha Eken brothers; Suat Mamat who scored three goals in the 1954 FIFA World Cup; Coşkun Özarı who devoted his life to Galatasaray; Turgay Şeren the heroic goalkeeper who was called "the Panther of Berlin"; Fatih Terim, the team captain of Galatasaray and Turkish national football team for many years, who won the UEFA Cup in 2000 as the team's coach; Metin Oktay the legendary six-time top-scorer of the Turkish Super League; Zoran Simović, another skilled goalkeeper known for his penalty saves; Cüneyt Tanman who played a record of 342 games for Galatasaray; Tanju Çolak, an extraordinary goalscorer and the 1988 European Golden Boot winner with Galatasaray; Cevad Prekazi, an Albanian teammate of Tanju Çolak specializing in free kicks; Cláudio Taffarel the World Cup-winning goalkeeper for Brazil; Gheorghe Hagi, the Romanian football hero who is still described as the best foreign player ever to play in Turkey; Brazilian striker Mário Jardel, dubbed "Super Mário" by the fans and scored both of Galatasaray's two goals in the 200 European Super Cup Final against Real Madrid; and last, but not least, Hakan Şükür, the player who scored most goals in Süper Lig history with 249. The name Galatasaray (Turkish pronunciation: [ɡaɫatasaˈɾaj]) itself comes from that of Galatasaray High School, which took its name from Galata Sarayı Enderûn-u Hümâyûn ("Galata Palace Imperial School"), the name of the original school founded on the site in 1481, and which in turn took its name from the nearby medieval Genoese citadel of Galata (the modern quarter of Karaköy) in the Beyoğlu (Pera) district of Istanbul. Thus Galatasaray literally means "Galata Palace". "Galatasaray" is a compound word and it is pronounced as such, with a very brief pause between the two words. There is no diminutive form of the club's name. Fans refer to the club either by its full name or by its nickname Cim-Bom(-Bom)—pronounced [dʒim bom (bom)])—of uncertain etymology. However, the shortened form "Gala" is sometimes used by English speakers. At first, the colours of Galatasaray were red and white. These are the colours in the modern Turkish flag. The Turkish Republic, however, was not founded at that time. Therefore, this decision caused the repressive administration of the day to feel uncomfortable and the administration subsequently pressured the footballers. For this reason, on December 26, 1906 the colors were changed to yellow and black,. The eight-piece halved design kit was ordered from the Sports Outfitter William Shillcock based in Birmingham, United Kingdom. After a heavy 0-5 lost to Baltalimanı in a friendly match the new colours yellow and black were counted as inauspicious. On 6 December 1908, for a match against the football team of the Royal Navy cruiser HMS Barham, Galatasaray finally settled on playing in red and yellow, inspired by the roses which Gül Baba offered to Sultan Bayezid II.Ali Sami Yen stated, "After we have been in and out of several shops, we saw two different elegant-looking wool materials in Fatty Yanko's store at Bahçekapısı (between Eminönü and Sirkeci in Istanbul, now called Bahçekapı). One of them was quite dark red, resembling the cherry color, and the other a rich yellow with a touch of orange. When the sales clerk made the two fabrics fly together with a twist of his hand they became so bright that it reminded us the beauty of a goldfinch. We thought we were looking at the colors flickering in burning fire. We were picturing the yellow-red flames shining on our team and dreaming that it would take us to victories. Indeed it did." The Galatasaray home kit have always been fundamentally the same since 1908. The traditional shirt of Galatasaray is the eight-piece halved design. This consists of the shirt’s front, back and sleeves being made up of two colours, resulting in the shirt being split into eight parts. (Two same colours are never next to each other within the 8 parts.) The colours continue in an alternating order, from yellow to red. This results in the front of the shirt being the opposite of the back and the shirt also having an halved design from the side. This alternating colour order of eight parts creates a complete halved design for the shirt. The classic eight-piece halved design would become the look of Galatasaray for around 80 years, until 1985 when sportswear manufacturer Adidas began to provide the shirts and the sleeves were made up by one colour and not halved. Created over a century ago, the classic Galatasaray kit combination consists of the eight-piece halved traditional shirt, white shorts and red socks and are usually worn as part of the home strp. This changed in the mid-1980s, when sportswear manufacturer Adidas began to provide the shirts. The club reverted to the "classic" kit in 2012. The official colours are Pantone shades 1235 (yellow) and 201 (red). Since 2016, Galatasaray's shirt sponsors have been nef. Previous sponsors include: Volvo and PeReJa (1977–78); Halı Fleks (1979–80); Telefunken, Alo, and THY (1980–81); Borsaş and Meban (1981–83); Telefunken (1983–84); Modell's (1984–85); Denizbank (1984–86); TürkBank (1986–91); ADEC Saat (1991–92); SHOW TV (1991–95); Emek Sigorta (1992–95); VakıfBank (1995–97); Bank Ekspres (1997–98); Marshall (1998–2000); Telsim (2000–01); Aria (2001–04); Avea (2004–09); Türk Telekom (2009–14); Huawei for domestic matches (2014–2015) and Turkish Airlines for UEFA Champions League matches (2014–2016). When Galatasaray were formed no Turkish teams had their own home ground, and all games in the Istanbul Football League took place at Papazın Çayırı – now the site of Fenerbahçe's Şükrü Saracoğlu Stadium. In 1921 the city's first proper football stadium was constructed, Taksim Stadium, which was used as the home ground for all of Istanbul's teams. When historic Taksim Stadium was demolished in 1940, Galatasaray decided to build a large, modern stadium. Due to difficulties stemming from World War II, construction was delayed for over two decades. In this period, they played in Şeref Stadi and Dolmabahçe Stadi On 20 December 1964, Ali Sami Yen Stadium opened. Named after the founder of Galatasaray, Ali Sami Yen, it is in the Mecidiyeköy quarter of the Şişli district at the center of the city. In 1964, the stadium had capacity over 35,000. Due to improvements in security and prohibition of non-seater spectators, the all-seater capacity reduced to 22,000 in 1993. A few years later, the rebuilt of main stand, which was damaged by an earthquake, slightly increased the capacity. After 2002, when Atatürk Olympic Stadium was built for Istanbul's Olympic Games bid, Galatasaray started to play European Cup matches there. The attendance record among Turkish stadiums was broken there, in Galatasaray–Olympiacos match played in front of 79,414 spectators. Yet, Ali Sami Yen Stadium has historic importance for Galatasaray fans although it is smaller and older. The stadium was in 2011 demolished after Galatsaray moved to the newly built Türk Telekom Stadium. The new home ground of Galatasaray is the newly built Türk Telekom Stadium in the Seyrantepe area of Sarıyer. The new stadium, which was opened 15 January 2011, has a capacity of 52,223 seats, making it the largest private stadium used by a club in Turkey. Since 1992, after every goal scored by Galatasaray, the last part of the song "I Will Survive" by the Hermes House Band is played. Although the song is in English, the part used has no lyrics except "la la la la". In addition, before every game the Galatasaray War Chant, which is borrowed from the original Warchant created by Florida State University, is played accompanied by what the fans call a "scarf show" where fans display and wave their Galatasaray scarves, banners and flags. Many people[who?] call the Turk Telekom Stadium 'Cehennem' (hell) because of stadium anthems and the continuous roar of the fans. Galatasaray fans broke the "loudest crowd roar at a sport stadium" record on 18 March 2011 at Galatasaray’s new stadium Türk Telekom Stadium in Istanbul. A peak reading of 140.76 dBA was recorded. The latest poll by June 2012 places Galatasaray in the first place with a 41.8% level of popularity while Fenerbahçe S.K. comes second with a 35.9% level, Beşiktaş J.K. third with 16.3% and Trabzonspor fourth with 4.7%. "The big three" clubs of Istanbul – Beşiktaş, Fenerbahçe and Galatasaray – have a century-long history of rivalry. The Galatasaray–Fenerbahçe rivalry is the primary Istanbul derby and the most important rivalry in Turkish football. The rivalry poses a symbolic importance to supporters as much as the result. Supporters are often quoted as stating that winning the league without winning the derby is hollow. There is always huge interest in the derby due to its fierce nature on and off the pitch. Many documentaries have been made about the derby including an episode of The Real Football Factories International. The rivalry has led to violence among supporters on numerous occasions, though this has been on the decline in recent years. The typical features of derby days include sell out stadiums, loud support throughout the match and taunting choreography displays by supporters before kick off. Other top level İstanbul derbies include the teams; İstanbul BB and Kasımpaşa although these teams pose a minor rivalry as the history and the nationwide attention to the derbies among the big three is unmatched. Sources:Note: Flags indicate national team as defined under FIFA eligibility rules. Players may hold more than one non-FIFA nationality. Only professional players and/or players with first team numbers are listed. Note: Flags indicate national team as defined under FIFA eligibility rules. Players may hold more than one non-FIFA nationality. The presidents in the early 1900s can not be identified entirely because of gaps in knowledge, due to wars and other negative local externalities such as coups and government intervention. ^ "Tweets with replies by melih sabanoglu (@melihsabanoglu) - Twitter". twitter.com. ^ "Galatasaray Nasıl Kuruldu". galatasaray.org. ^ "GALATASARAY SPORTİF SINAİ VE TİCARİ YATIRIMLAR A.Ş. : General Information". Turkish Public Disclosure Platform (KAP). Retrieved 5 November 2017. ^ "Galatasaray EN on Twitter". ^ "Galatasaray, Ağustos ayının en iyisi". arsiv.ntvmsnbc.com. ^ "First match and foundation". Galatasaray.org. 17 November 2007. Archived from the original on 10 April 2008. ^ "How Galatasaray Founded". Galatasaray.org. 23 November 2007. Archived from the original on 9 May 2008. ^ a b "History of founding from official site". Galatasaray.org. 22 November 2007. Archived from the original on 10 April 2008. ^ "History of Turkish football". Tff.org. 21 November 2007. ^ "Information about Turkish Cup". Tff.org. 20 November 2007. ^ "News about Galatasaray Match". BBC.co.uk. 18 October 2007. ^ "Eşfak Aykaç Profile". Galatasaray Official. 24 November 2007. Archived from the original on 17 October 2007. ^ "Boduri Profile". Galatasaray Official. 24 November 2007. Archived from the original on 17 October 2007. ^ "Mehmet Leblebi Profile". Galatasaray Official. 24 November 2007. Archived from the original on 17 October 2007. ^ "Gündüz Kılıç Profile". Galatasaray Official. 24 November 2007. Archived from the original on 17 October 2007. ^ "Suat Mamat Profile". Galatasaray Official. 24 November 2007. ^ "Coşkun Özarı Profile". Galatasaray Official. 24 November 2007. Archived from the original on 17 October 2007. ^ "Turgay Şeren Profile". Galatasaray Official. 24 November 2007. Archived from the original on 17 October 2007. ^ "Fatih Terim Profile". Galatasaray Official. 24 November 2007. Archived from the original on 17 October 2007. ^ "Metin Oktay Profile". Galatasaray Official. 24 November 2007. Archived from the original on 17 October 2007. ^ "Zoran Simovic Profile". Galatasaray Official. 24 November 2007. Archived from the original on 17 October 2007. ^ "Cüneyt Tanman Profile". Galatasaray Official. 24 November 2007. Archived from the original on 17 October 2007. ^ "Tanju Çolak Profile". Galatasaray Official. 24 November 2007. Archived from the original on 17 October 2007. ^ "Prekazi Profile". Galatasaray Official. 24 November 2007. Archived from the original on 17 October 2007. ^ "Taffarel Profile". Galatasaray Official. 24 November 2007. Archived from the original on 17 October 2007. ^ "Hagi Profile". Galatasaray Official. 24 November 2007. Archived from the original on 17 October 2007. ^ "Galatasaray Spor Kulübü Resmi Internet Sitesi". Galatasaray.Org. Retrieved 10 April 2013. ^ "Yellow Red since 100 Years". GALATASARAY.ORG. ^ a b c "Galatasaray kits". Galatasarayformalari.com. Archived from the original on 22 June 2014. Retrieved 10 April 2013. ^ "Galatasaray home kit history". Galatasarayformalari.com. Retrieved 10 April 2013. ^ "En Eski Stadı". İstanbul'un Enleri. 16 September 2007. Archived from the original on 22 December 2008. ^ "Ali Sami Yen Stadium". Archived from the original on 9 June 2007. Retrieved 26 November 2007. ^ "Ali Sami Yen Stadium Information". The Stadium Guide. Retrieved 26 November 2007. ^ "Zulümpiyat! Stadı". Fotomaç. 20 October 2006. Retrieved 15 July 2007. ^ Telekom, Türk. "Türk Telekom Stadyumu". Retrieved 14 March 2018. ^ "Stadium info". Galatasaray SK. Archived from the original on 4 November 2011. Retrieved 9 November 2011. ^ "TRT - Anasayfa". TRT. ^ Minshull, Phil. "Goodbye to Hell". BBC. Retrieved 9 November 2011. ^ Tozar, Türker. "Galatasaray depart Ali Sami Yen stadium with win". UEFA. Retrieved 9 November 2011. ^ "En fazla taraftar kimde?" (in Turkish). Internethaber.com. 5 January 2007. Retrieved 31 December 2015. ^ "Taraftarın gerçek yüzü!". Ligtv.com.tr. 15 December 2008. ^ "En çok taraftar hangi takımda? İŞTE CEVABI". Samanyolu Haber. 6 April 2010. ^ "Türkiye'de En Çok Taraftara Sahip Takım Hangisi?". Sabah Gazetesi Spor Sayfası. 13 June 2012. ^ "Turkey to send anti-terror police to Leeds to protect Galatasaray". CBC. 11 November 2000. ^ "Galatasaray find new home while 'Hell' rebuilt". ABC Sport. 7 June 2003. Archived from the original on 18 March 2008. ^ "UEFA Rankings". UEFA.com. UEFA. Retrieved 24 September 2018. ^ "Futbol Takım Kadrosu - GALATASARAY.ORG". www.galatasaray.org. ^ Goals in all competitions are counted. ^ "List of Youth League Champions". Turkish Football Federation. Archived from the original on 5 January 2008. Retrieved 21 May 2008. ^ "Galatasaray Sportif AŞ - GALATASARAY.ORG". www.galatasaray.org.